Bring your picnic blanket and your best pie to share with the community- made from locally sourced fruit! Support GreenUP Ecology Park, the Nourish Project and local growers at Peterborough’s Farmers Markets, or best yet – use fruit from your own trees! Pie categories will include best Sweet, Savory and People’s Choice for the Best Pie at the park! Learn all about Nourish’s food projects including Tree for the Picking and Gleaning programs, as well as a flour making demo from our local Grain Seed Savers Collective. Did you know Ecology Park now carries a variety of fruit and nut trees ? Wander through our Food Forest and tree nursery to discover hardy varieties of apple, pear, peach, plum ,cherry and hazelnut trees. We will be raffling off some of these terrific trees at the picnic, so don’t miss out! Cost: $10 Donation plus your pie! Step 1: Make a pie using local ingredients! 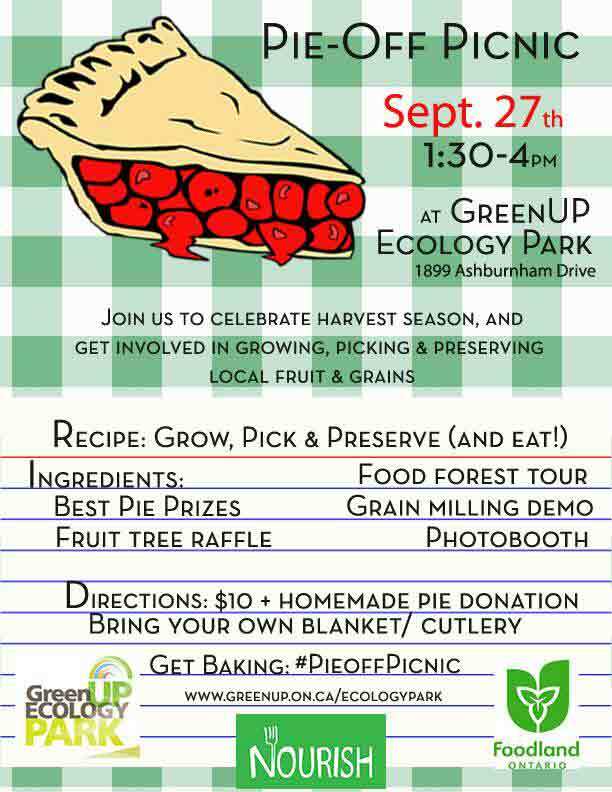 Step 2: Pack a blanket, utensils, your amazing pie and $10 donation to Ecology Park on Sept 27th at 1:30 pm. Step 3: Enjoy the beautiful gardens at Ecology Park , eat delicious pie and learn about the great food programs happening with GreenUP and Nourish Peterborough.